The Franklin Institute, a premiere American science center, will present Philadelphia’s first ever ballet created for the Fels Planetarium. Choreographer Nora Gibson (USA) in collaboration with digital artist and programmer Jason Haggerty (AUS) created a ballet using scanners and specialized software to transform dancers into point clouds. Mandala is Gibson’s first ballet for a virtual environment, and it keeps with her growing body of work that brings together the fields of science, mathematics, and technology with ballet. Music for this piece (running time 6 minutes 45 seconds) was created by celebrated minimalist electronic composer, France Jobin (CA). In Mandala, Gibson takes the classical form, unlocks it from the restrictions of the physical world, and uses the technology to depict the body and our universe of stars as interconnected entities. This event is part of The Franklin Institute’s Star Party After Party of the Philadelphia Science Festival. The Franklin Institute, a premiere American science center, is excited to present Philadelphia’s first ever ballet created for the Fels Planetarium. 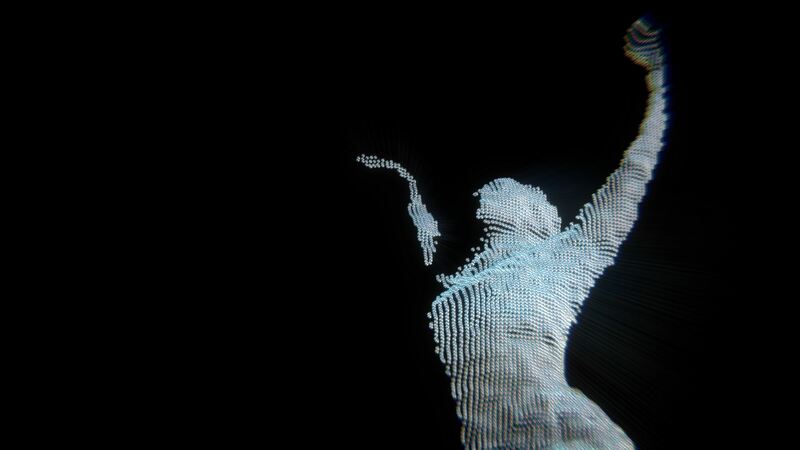 Choreographer Nora Gibson (USA) in collaboration with digital artist and programmer Jason Haggerty (AUS) created a ballet using scanners and specialized software to transform dancers into point clouds. Mandala is Gibson’s first ballet for a virtual environment, and is in keeping with her growing body of work that brings together the fields of science, mathematics, and technology with ballet. Music for this piece (running time 6:45) is by celebrated minimalist electronic composer, France Jobin (CA). In Mandala, Gibson takes the classical form, unlocks it from the restrictions of the physical world, and uses the technology to depict the body and our universe of stars as interconnected entities. See this visually stunning work that is truly on the vanguard of art and technology. Stay for the party afterward. Nora Gibson is an American, female choreographer evolving ballet for the 21st century. Gibson is interested in the beauty of the natural world, as evidenced in mathematics and science, and in working across artistic and academic disciplines to expand ballet’s reach. Gibson trained at Baltimore School for the Arts, Chautauqua, and NCSA, and earned a BFA from Tisch, at NYU. In addition to performing in the genres of ballet and contemporary dance in MD, D.C., and NY, Gibson was selected to work from 2010-2013 with Lucinda Childs to perform various iconic 70s works as part of the Pew Center for Arts and Heritage’s Virtual Reconstruction project. Gibson has been invited as a resident artist in the US and abroad, including the nEW Festival in Philadelphia (2009-10), the CEC New Edge Residency (2009-10), the Ellen Forman Memorial Award (2011), the PHL/Poland Artist Exchange Residency (2012), the Choreographers on Campus Residency, funded through the Andrew W. Mellon Foundation (2014), Diepenheim Werkplaats (2016), and Kaatsbaan (2017). Gibson’s choreography has been presented by New Dance Alliance at Joyce SOHO, at Dance Place in Washington DC, Philadelphia Dance Projects, The Williams Center for the Arts, and the Franklin Institute. Her choreography was featured in Transfixion Films’ Dark White, presented at the 2015 Triskellion Dance Film Lab in Brooklyn, NY. Gibson’s work has received consistent critical acclaim, heralded by the Philadelphia Inquirer as “the most authoritative work in Philadelphia. . .” Gibson’s innovative approach to ballet garnered her an invitation to speak about her work for an audience of programmers and visual artists at MUTEK, and international festival for digital art and electronic music, in 2018. Gibson’s work has been commissioned regularly by universities such as Bryn Mawr College, Drexel University, Georgian Court University, and University of the Arts. Gibson is a teacher, and has taught ballet and composition in the US and abroad, including Temple University, University of the Arts, the Zawirowania Festival, and many other institutions. Gibson also makes digital art under the name of Chroma and performs in A/V shows currently scheduled in the US and Canada. Jason Haggerty With formal training in fine art, digital media, and interactive media, Haggerty works in a multitude of environments in several different media. Recent years, however, have been focused on developing his real-time procedural programming skills in software such as TouchDesigner and Notch, in combination with 3D modelling for screen, graphic and web design, and video production. With a penchant for real-time media, Jason creates live audio-visual performances for festivals such as Rainbow Serpent Festival and is producing full-dome AV works to be premiered in the US in 2019. He has also created interactive visuals for stage, using Notch integrated with Black Trax. Employing, motion-tracking, depth cameras, touch screens and custom-built controllers, Jason has devised and developed many interactive installations, including interactive artworks for Griffith University, HOTA, and Glow Festival. The Franklin Institute Founded in honor of America’s first scientist, Benjamin Franklin, The Franklin Institute is one of the oldest and premier centers of science education and development in the country. Today, the Institute continues its dedication to public education and creating a passion for science by offering new and exciting access to science and technology in ways that would dazzle and delight its namesake. In the spirit of inquiry and discovery embodied by Benjamin Franklin, the mission of The Franklin Institute is to inspire a passion for learning about science and technology. As the most visited museum in the Commonwealth of Pennsylvania and a top-five tourist destination in the City of Philadelphia, The Franklin Institute is one of the leading science centers in the country, and serves as both a prominent educational and cultural resource, and as an anchor of the local economy. Science and technology have the potential to solve some of the most critical issues of our time, to improve our lives, and to inspire our curiosity about the world around us. Every day The Franklin Institute provides resources that help people to connect with science and technology in creative ways that resonate with learners of all ages and backgrounds. The Institute directly reaches more than 1 million people each year with informal learning experiences that engage students, adults, and families. Though its historic museum is a central learning space, the Institute has evolved to provide people with educational resources in their own neighborhoods through hands-on activities in classrooms, workshops in libraries, community centers, and other settings, and through ways to interact online. Since 1824, The Franklin Institute has pursued its commitment to making these resources available to as many people as possible throughout the mid-Atlantic region.